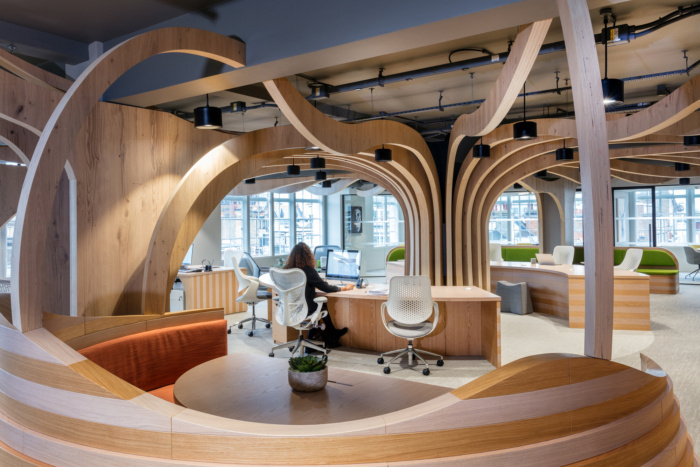 A UK construction company with a decentralized nature, Morgan Sindall's newly redesigned London offices features a tree that guides employees to various spaces of collaboration and connection. Morgan Lovell has created an inspiring workplace for Morgan Sindall Group, a British construction company, located in London, England. Morgan Sindall Group wanted to create a unique environment that inspires creativity, supports collaboration, and above all, creates a destination workplace that lives and breathes their cultural values. The existing office space wasn’t supporting the company’s culture and wellbeing requirements, so a complete re-invention was needed to create an office that truly reflected their brand. The client wanted to challenge the status quo and represent the decentralized nature of the business, which is where the idea for the tree came from. Collaboration spaces was a key requirement and the new design offered up places to meet and collaborate from rooms to hub desks. Private spaces were key to efficiently enabling agile working in this smaller floorspace. These cozy booths were specifically designed to provide a retreat from the open-plan, somewhere staff could take a call, have a video conference or simply concentrate in private. Wellbeing and sustainability were both important to the client, and something their group of companies aim for across their projects. Natural materials including wood and moss, as well as a variety of working spaces gives staff a boost. The project achieved a SKA Gold accreditation for minimizing its impact on the environment, with a spectacular 95% of project waste diverted from landfill.